Pune may be a ‘small’ city, but it has a lot to offer! 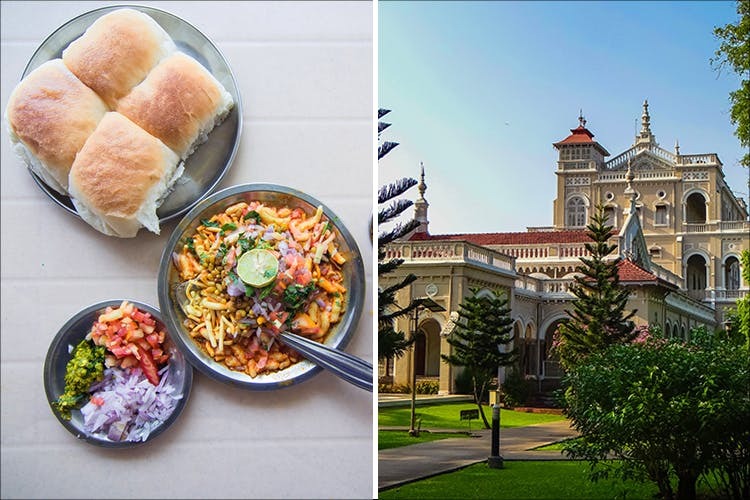 From ancient architecture, to lip-smacking grub, here’s a list of 5 things that Pune is well-known for. Pune (then, Poona) was the cultural capital of Maharashtra, and earned itself the nickname, ‘Oxford of the East’ way back in the day – owing to its association with the fields of literature, art, theatre, science, etc. as a hub for learning. In 1949, the University of Poona (now, Savitribai Phule Pune University) was established with only 18 colleges. Currently, the University has over ‘433 affiliated colleges, and 232 recognised research institutions’. Even today, Pune has a vast number of educational institutions that span almost every field of study you could imagine – literary, arts, science, commerce, law, medicine, etc. that continue to attract scholars and learners from far and wide. Not to forget, FTII (Film & Television Institution Of India) that has produced big names like Naseeruddin Shah, Mithun Chakraborty, Rajkummar Rao and many more, is also based out of Pune. #LBBTip: Read more about Pune University’s history, here. As early as the 1870s, British officers stationed in Poona (a garrison of the British Empire) developed a variation of the ‘battledore and shuttlecock’ game – which was very popular at the time. This newly derived game was called ‘Poona Game’ and the rules are said to have been drawn up here first (said to have been at Ammunition Factory in Khadki), in 1873. Later on, the game was carried back to England by the officers from Poona, re-dubbed ‘badminton’, was then further developed into the game we now know, today. #LBBTip: Here’s our guide to badminton courts you can play at, in Pune. Pune is a hot-spot for historical sites. For tourists and locals alike, there’s plenty to discover in our city – from ancient Wadas to former Palaces, bustling markets, to warrior memorials; and even a 169-year old libarary. If you have limited time to explore, or are looking for a quick tour of the city’s most popular historical sites, check out the Pune Darshan Mini-Bus Tour by GeoDirect here. Of course, places like Shaniwar Wada and Aga Khan Palace have a firm-rooted place in Pune (and India’s) history, but there are also lesser-known sites that are worthy of your time and attention, and you can read about them here. #LBBTip: Pune is also known for its rapidly growing craft-beer culture. That being said, here are 5 Pune-based breweries you need to know about. Pune has direct access to the ‘great outdoors’; from the hilly slopes of the Sahyadris, to vast freshwater lakes (Pawna, Khadakwasla), and the ‘table-top’ Deccan plateau. This makes it ideal for adrenalin junkies and adventure-seekers. For the best campsites around Pune, check out our guide here; and if you prefer something more intensive – check out these 5 forts you can trek to, here. Pune is also home to the first-of-its-kind specialty private indoor climbing gym – Rock Aliens Climbing Gym, and (currently) the only pump-track in Western India – Spirit of Mogli. #LBBTip: These 5 air-borne activities around Pune also make for the perfect adrenalin rush.